I have written a lot about the potential of low-Earth orbit (LEO) satellites for Internet service, but have not said much about medium-Earth orbit (MEO) satellites — until now. O3b (other three billion) is an MEO-satellite Internet service provider. Greg Wyler founded the company, and it was subsequently acquired by SES, a major geostationary-orbit (GSO) satellite company. (Wyler moved on to found future LEO Internet service provider OneWeb). O3b's MEO satellites orbit at an altitude of around 8,000 kilometers, complementing the SES GSO constellation, which orbits at around 36,000 km. 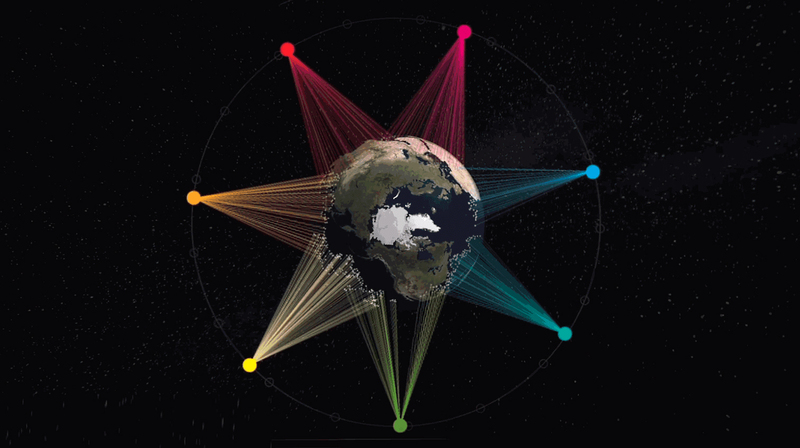 Because of their altitude, the GSO satellites have large footprints and are good for video broadcast and other asynchronous applications, but their latency can cause noticeable delays in applications like telephony or browsing modern, complex Web sites which may have many elements — images, text, video, programs, etc. — each adding transmission and error-checking overhead. The International Telecommunication Union says that if one-way latency is less than 150 milliseconds, users of most applications, both speech, and non-speech, will experience essentially transparent interactivity. I've never used an O3b link, but they promise a round-trip latency of under 150 milliseconds, so I assume they work well for voice calls, where GSO satellites would introduce a perceptible delay. However, an MEO link might be noticeably slower than a LEO link while browsing modern Web sites. O3b launched four satellites last week and they plan to launch four more early next year. That will bring their constellation to 20 satellites and enable them to continue expanding their current business of serving relatively large customers like mobile phone companies, government organizations, and cruise ship lines. for example, they serve Digicell which has over 40,000 LTE accounts in Papua New Guinea. There is a growing market for O3b's current service, but their next-generation satellite-communication system, called mPOWER, will be much improved and will compete in some applications with terrestrial fiber and, in the future, with LEO constellations. The initial mPOWER constellation of seven satellites was designed and will be manufactured by Boeing. While today's O3b satellites have ten steerable edge-terminal beams, the mPOWER satellites will have over 4,000 steerable beams that can be switched under program control giving the constellation over 30,000 dynamically reconfigurable beams and over 10 Tbps capacity. The highly-focused beams will address single terminals, not wasting power on locations with no users. The constellation will be launched in 2021. O3b has also contracted with three customer-edge terminal manufacturers ALCAN, Isotropic Systems and Viasat. I don't know the prices or capabilities of these terminals, but it is porbably safe to say they will be electronically steerable utilizing different antenna technologies and have different prices and characteristics for different applications. I am guessing that ALCAN is working on a low-cost, flat-antenna terminal using their liquid crystal technology. In the press conference announcing mPOWER, SES Networks CEO emphasized that these were smart terminals — computers that happened to have antennas. They will be continuously connected and monitored and able to download software updates and new applications. They will be parts of an integrated system comprised of edge terminals, terrestrial POPs and gateways, SES GSO satellites, existing O3b and future mPOWER satellites and terrestrial fiber and wireless networks. The network will be dynamically configured under program control as a function of applications and cost. The first seven mPOWER satellites will be in equatorial orbit and cover nearly 400 million square kilometers between + and - 50 degrees latitude. Once mPOWER is up and running, SES plans to retire and not replace two of their GSO satellites, and they will add to the initial seven-satellite constellation when the capacity is needed. They will still market to customers like governments, ISPs, mobile phone companies and ship and airlines, but will be able to serve many more and smaller organizations. As I mentioned at the start of this post, I have been covering LEO Internet-service satellite projects for some time, and the two leading contenders are SpaceX and OneWeb. SpaceX launched their first two test satellites last month and they plan to start launching operational satellites in 2019. They will begin offering commercial service in the 2020-21 time frame and complete their first global constellation by 2024. OneWeb plans to begin offering service in Alaska in 2019 and to cover all of Alaska by the end of 2020. By 2025 they expect to have 1 billion subscribers. O3b mPOWER will be up and running before SpaceX, and OneWeb complete their global constellation — they may even have launched their second batch of satellites. The four satellites that were launched in March are now in orbit and operational, bringing the total number of MEO satellites in the O3b fleet to 16. Four more are scheduled to launch in the first half of 2019. That will be the last of their current generation satellites and they plan to launch seven next-generation, m-Power, satellites in 2021. At that time, they will have an integrated system of two generations of MEO satellites plus their geostationary satellites, positioning them to compete well in non-consumer applications like long-distance and maritime links and cellular backhaul. (The US Department of Defence just signed on as an O3b MEO customer). SES has published their Full Year 2018 Results. They reported a return to growth in fixed-data sales, citing a full year of revenues from O3b deployment with ETECSA in Cuba as a contributor. They also confirmed their O3b launch schedule. O3b satellites 17-20 will be launched the first quarter of this year and seven next-generation mPOWER satellites will be launched in the first half of 2021. Cuba might be planning to make significant use of these satellites for mobile backhaul and community connectivity. Local Time: Tuesday, April 23, 2019 09:07 PM PDT – Page Load: 0.3220 Sec.